Propolis is acomplex material collected by honeybees from plant and tree buds, resins and exudates. In the last recent years several research indicated that Algerian propolis possess a large spectra of biological activities such as antibacterial, antifungal, antioxidant and anticancer activities. Few studies on chemical composition of Algerian propolis indicate the presence of two propolis type mainly poplar1 and Mediterranean type2,3 with caffeate esters and flavonoids as main constituents of poplar type while Mediterranean type is rich on labdane and clerodane diterpes1. The objective of the present study is the determination of chemical composition of propolis sample collected from jijel. Chemical investigation allowed the isolation of 12 Compounds. Their structures were identified on the basis of spectral data (1H-NMR and 13C-NMR) and MS data and comparison with literature. All isolated compounds are flavonoids. Among the identified flavonoids pinocembrin, pinostrobin and galangin-3-methyl ether indicate that the studied propolis is a polpar type propolis. 1. Piccinelli AL, Mencherini T, Celano R, Mouhoubi Z, Tamendjari A, Aquino RP, Rastrelli L (2013) Chemical Composition and Antioxidant Activity of Algerian Propolis. Journal of Agricultural and Food Chemistry. 61: 5080−5088. 2. Graikou K, Popova M, Gortzi. O, Bankova V, Chinou I (2016) Characterization and biological evaluation of selected Mediterranean propolis samples. Is it a new type?. LWT - Food Science and Technology 65: 261-267. 3. Velikova M, Vassya Bankova V, Sorkunb K, Houcinec S, Tsvetkovad I, Kujumgiev A (2000) Propolis from the Mediterranean Region: Chemical Composition and Antimicrobial Activity. Z. Naturforsch : 55c, 790-793. ISNAD NARIMANE, Segueni , DIAZ, Jesus. G. , SALAH, Akkal , SALAH, Rhouati . "Flavonoids Constituents of Algeria Propolis". 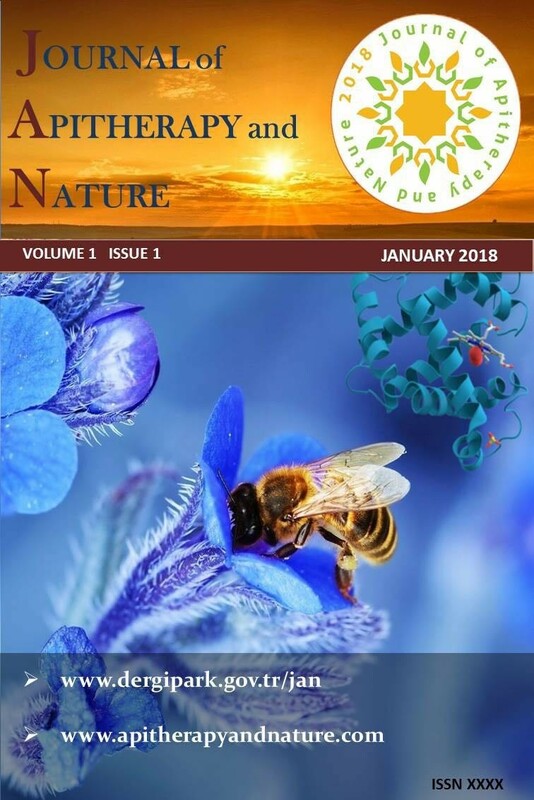 Journal of Apitherapy and Nature 1 / 3 (December 2018): 69-69.